By December the days of summer sun, trout rising for hoppers, and wet wading are a distant memory and traded for waders, icy boat ramps, and frozen rod guides. Winter in Montana is the real deal. 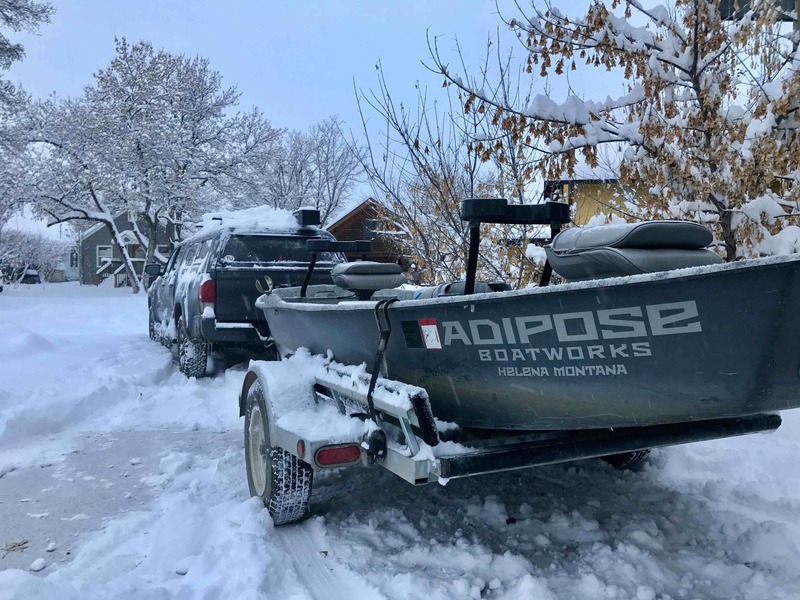 Short days, snow, and wind make for generally tough fishing conditions. Many of the rivers freeze over and ice dams form across many rivers and over many boat ramps statewide. For most of this time our Montana fly fishing guides trade our fly rods and sunglasses for bobbins and thread and put in time at the fly tying bench. Occasionally the stars do align, we get a break in the weather, and we go fishing. On these warmer and calmer days during the winter in Montana the nymph fishing can be great. Deep slow water can hold lets of fish eager to feed on a nice day. Winter weather in Montana does break now and again, and if your winter ski trip to Big Sky Resort or Bridger Bowl turns into 35+ degrees and sunny, consider a day of guided fly fishing instead. Guided fly fishing trips we outfit in the Winter won’t get booked more than a week in advance and are always subject to changing weather conditions. Most of our fisheries are unavailable to fish. There are however several notable exceptions: the Paradise Valley Spring Creeks, the Missouri River, the Bighorn River, and the Gallatin River. Interested in winter fly fishing trips? Check out our Winter/Spring Guide Trip Specials. If you find yourself in Montana in the winter and need your fly fishing fix, give us a call and we'll make it happen.